Only a few watch movements made it to the status of icon, giving the model they were cased in an instant added value. The Omega caliber 33.3 CHRO is part of this exclusive horological marvels that shaped history. Launched in 1933 the first model using this caliber had only one apparent chronograph pusher when the second one was merged into the crown. 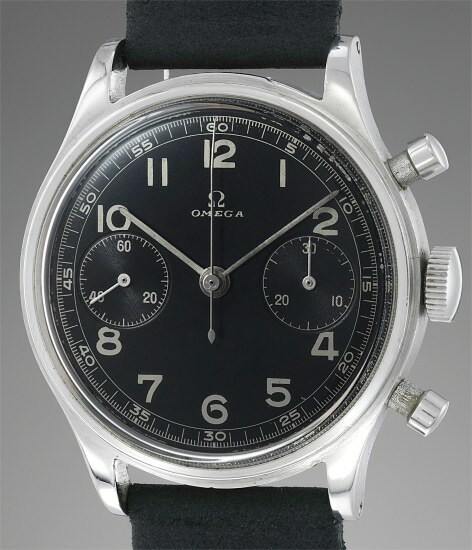 In the late 30s, Omega redesigned it to power some of their finest two pusher chronographs. The two-body stainless steel case with water resistant caseback has perfectly protected the superb black glossy dial from the effect of time and moisture. The contrast between the black glossy dial and the silver printings is absolutely striking and gives the watch a very powerful and masculine aspect. The case is further completed by two circular chronograph pushers as opposed to the olive shaped pushers found on earlier generations. A strong case with sharp lugs will finish to convince the most demanding collector.